Hair loss is one of the most well-known side effects of chemotherapy cancer treatment. It’s also a side-effect of other medical conditions and treatments. 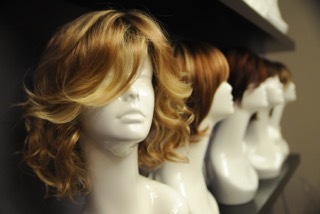 We work with all women in need of wig selection and customization due to medical circumstances. Many patients find losing their hair the most challenging part in coping with the diagnosis and treatment of cancer or other medical treatments – understandably as our appearance is closely linked to our self-esteem and feelings of wellbeing. At our Oklahoma City wig salon, Cancierge offers wigs for cancer patients as well as for patients dealing with hair loss associated with other medical conditions. We are pleased to have an in-house wig stylist, Amy Heise, who works with each of our patients to find a personalized cut and style. Cancierge offers a wide variety of wigs, scarves and hats in order to provide women many options – at every price point. For most cancer patients, hair loss is inevitable. However, it does not have to define your cancer journey. In the privacy of the Cancierge Wig Salon, you can move through the hair loss process in your own way. We address this delicate subject in a warm and caring environment that will ease the stress associated with cancer-related hair loss, as well as hair loss associated with other conditions such as alopecia. We give all our clients support in defining their own sense of style. We’ll make recommendations according to head and face shape and the desired “look.” We will find the right color and style among our great selection of quality wigs to help you feel fabulous until your hair returns. Some clients decide to celebrate this transition with a group of close friends during a head shaving and wig party. Some clients prefer the one-on-one, compassionate support from our experienced staff. Cancierge has many options to accommodate your preferences.